Squamous cell carcinoma (SCC) is an uncontrolled growth of abnormal cells arising in the squamous cells, which compose most of the skin’s upper layers (the epidermis). This is also the most common type of malignant tumor in the nose and paranasal sinuses (70–80%). Squamous cell carcinomas detected at an early stage and removed promptly are almost always curable and cause minimal damage. However, left untreated, they eventually penetrate the underlying tissues and can become disfiguring. A small percentage even metastasize to distant tissues and organs and can become fatal. A tissue sample (biopsy) will be examined under a microscope to arrive at a diagnosis. If tumor cells are present, treatment is required. Fortunately, there are several effective ways to eradicate squamous cell carcinoma. The choice of treatment is based on the type, size, location, and depth of penetration of the tumor, as well as the patient’s age and general health. Surgical resection is often used to treat squamous cell carcinoma. 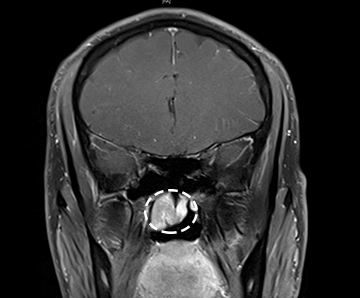 This is a 46-year-old who male initially presented with increased post-nasal drainage for a period over 1-year. He was first treated by a local ENT with a course of antibiotics and a steroid nasal spray, however, a CT scan and a nasal endoscopic examination identified a right sided nasopharyngeal mass. Following this discovery, a biopsy was taken and the pathology returned with the diagnosis of squamous cell carcinoma (SCC). He underwent an endoscopic resection of the tumor through the nose and sinuses, which was followed by cycle of radiation therapy and chemotherapy. He is followed routinely by an otolaryngologist and has new CT and MRI scans reviewed periodically. He is now 1 year out from surgery with no signs of recurrence. This is a 64-year-old male who presented initially two years ago to an oral surgeon with complaints of front (anterior) upper loose teeth and pain. 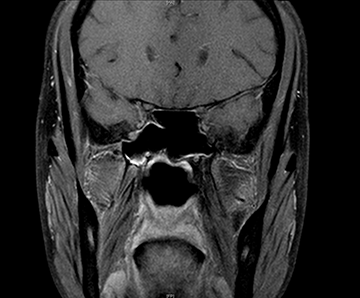 A CT of the neck and sinuses was performed and it showed findings consistent with squamous cell carcinoma (SCC). He underwent an endoscopic resection of the tumor and reconstruction of the palate and nasal septum. A recent PET scan showed signs of a potential recurrence and revision endoscopic resection was done 2 years after the first resection. Since the most recent surgery, completed a few months ago, there has been no evidence of recurrence or distant metastases (spreading of the tumor). He continues to complain of chronic dry mouth, some taste disturbance and some difficulty swallowing but otherwise his symptoms remain stable and has done well post operatively.